Please note that the content of this book primarily consists of articles available from Wikipedia or other free sources online. 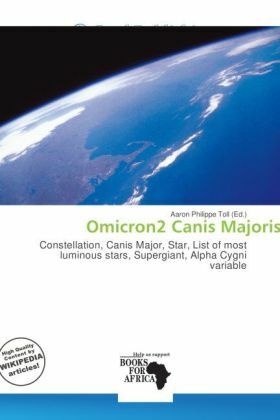 Omicron2 Canis Majoris is a star in the constellation Canis Major. It is one of the most luminous stars known, a supergiant that has used up the hydrogen fuel in its core and has entered the evolutionary stage where it is fusing helium atoms to form carbon. When it has used up its fuel, it is likely to become a supernova. ² Canis Majoris is classified as an Alpha Cygni-type variable star and its brightness varies from magnitude +2.98 to +3.04.